The foam shop stocks a range of packaging and case foams which aid turning your ideas into reality. Technology today has given us the ability to provide an aperture cutting service, allowing us to do justice to your display or packaging cases. For when support and protection is at the forefront of your mind, the Foam Shop is the only company you should be getting in touch with. 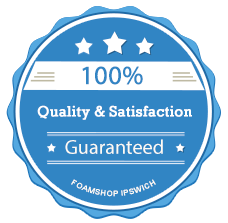 We stock an extensive range of foams which all offer different qualities and we tailor our service to supplying to suit your needs. With the 'zote' foams we can supply in sheet form, we will need to know quanties and colour preferences, to provide you with a quote. On average the sheet sizes are 1 meter x 1.5 meters, 1 meter x 1.85 meters, 1 meter x 2 meters, this is all depending on the 'zote' foam ordered. As this is a tailor made service and no two case ideas are the same, we need you to contact us here with your requirements and sizes and we can offer you a quote.